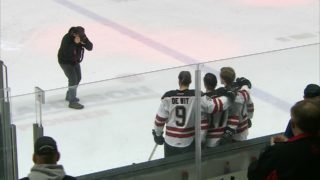 Is there truly a serious level of dislike between the Red Deer Rebels and the Lethbridge Hurricanes, as it certainly appears through four games of the WHL Eastern Conference quarter-final, or is it just that time of the year? “I have to agree with a little of both,” Rebels forward Brandon Hagel said Friday. The environment has certainly been hostile to this point in the series — which the ‘Canes lead 3-1 heading into Saturday’s Game 5 in Lethbridge — and Hagel has been involved in physical and verbal battles with several members of the opposing squad, including six-foot-five Ukraine defenceman Igor Merezhko (see above). According to Hagel, some of the animosity dates back to last spring’s first-round post-season series, in which the ‘Canes fought back from a 3-1 deficit to prevail in seven games. 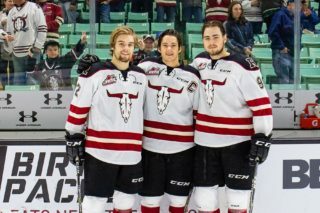 Rebels defenceman Carson Sass said the hard feelings are simply a result of the familiarity between the two clubs. “We see them a lot in the regular season and with that seven-game series last year it has definitely intensified things,” he said. 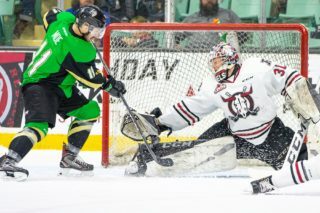 The Rebels posted their first victory of the series Wednesday by winning the special teams battle they had lost badly the first three games. 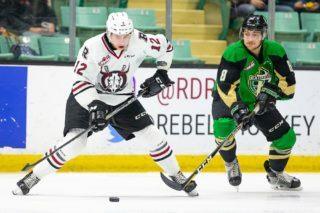 The Rebels controlled nearly every aspect of Game 4 and that has to continue in order for the series to return to Red Deer for a sixth game Sunday. “No one has won anything yet,” said Hagel. “You have to win four games and we know that. The Rebels might be down in the series, but their level of confidence is still high. “Getting that first W for the guys in playoffs for the first time, it’s a good feeling,” said Hagel. “I’ve been through it a lot but guys going through it for the first time . . . they have to feel pretty good about it. 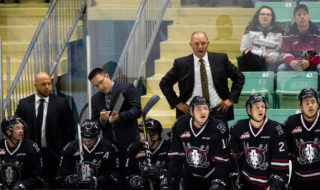 Sass insisted the Rebels can remain positive by looking back at the manner in which they performed over the final two months of the regular season, which was similar to Game 4. If the series returns to the Centrium, Sunday’s game will start at 6 p.m. A seventh game, if needed, will go next Tuesday in Lethbridge.